Author Ajay OhriPosted on January 17, 2012 Categories InternetTags applications, bit torrent, browser, Companies, content, data, encryption, Friends, Internet, open, Opera, Opera Unite, politics, ready, security, server, servers, sharing, software, torrent, US, use, web, Web server1 Comment on Using Opera Unite to defeat SOPA? The boys (and ladies) at opera have been busy writing code , while the rest of the coders on the cloud were issuing press releases, attending meetings or just sky diving from the cloud. Judging by the language of apps and extensions, it seems that the engineers de Vikings et Slavs were busy coding while the Anglo Saxons were busy preparing for IPOs. 2) The lovely Opera Unite has incredible apps for peer to peer sharing. You can create your own spotify, host your own chat application, transfer files, remote manage your computer. C’est magnifique! This is a piece of science fiction. I wrote while reading Isaac Assimov’s advice to writers in GOLD, while on a beach in Anjuna. 1) Identify senators, lobbyists, senior executives of companies advocating for SOPA. Go for selective targeting of these people than massive Denial of Service Attacks. This could also include election fund raising websites in the United States. 3) Disrupt digital payment mechanisms for selected targets (in step1) using tools developed in Step 2, and introduce random noise errors in payment transfers. 4) Help create a better secure internet by embedding Tor within Chromium with all tools for anonymity embedded for easy usage – a more secure peer to peer browser (like a mashup of Opera , tor and chromium). or maybe embed bit torrents within a browser. 5) Disrupt media companies and cloud computing based companies like iTunes, Spotify or Google Music, just like virus, ant i viruses disrupted the desktop model of computing. After that offer solutions to the problems like companies of anti virus software did for decades. 6) Hacking websites is fine fun, but hacking internet databases and massively parallel data scrapers can help disrupt some of the status quo. This applies to databases that offer data for sale, like credit bureaus etc. Making this kind of data public will eliminate data middlemen. 7) Use cross border, cross country regulatory arbitrage for better risk control of hacker attacks. 8) recruiting among universities using easy to use hacking tools to expand the pool of dedicated hacker armies. 10) If you cant convince them to pass SOPA, confuse them 😉 Use bots for random clicks on ads to confuse internet commerce. Yes Opera is a browser but you may as well call it an OS. With an uncluttered design, some mind bending Opera Unite Peer to Peer features (in a browser!) 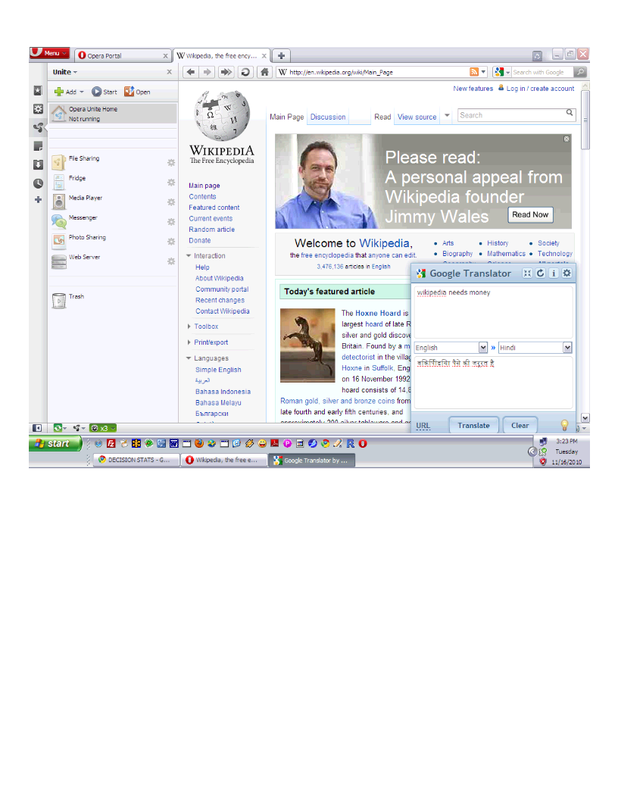 withhttp://unite.opera.com/applications/, and nifty widgets- try singing some Opera. I really dont know how browsers make money, especially since they are suing each other all the time, but well- heres to more choice – if you don’t want a corporation owned browser lusting to sell your leaked privacy data to Don Draper- Opera is a good choice- much better than Sea Monkey and the Fox .